There’s nothing new about narcissism; in either human evolution or art. Since time immemorial, we have been captivated by the sight our own image. The first mirrors, made of polished obsidian, date from as early as 6000 BC; remarkably, it took mankind a further 2500 years to get round to inventing the wheel. Apparently it would seem that even then, the image took precedence over all else; and that appearances were of the utmost importance. In art, narcissism is no less prevalent. One only has to look at the culture of self-portraiture; from the earnest, self-deprecating images of Rembrandt to the stern, steely gaze of Van Gogh, to see that self-image has long been a source of fascination for artists. Turning the artistic eye to our own image is often as much about self-discovery as it is about creating art; about trying to locate some sort of inner truth and a deeper understanding about our innermost essence. Narcissism and Art Revisited – The 21st Century Approach? During Art Basel Miami, I observed visitors interacting with my latest works. For those unfamiliar with them, my new series is comprised of stainless steel, polished until it offers a flawless mirror finish. 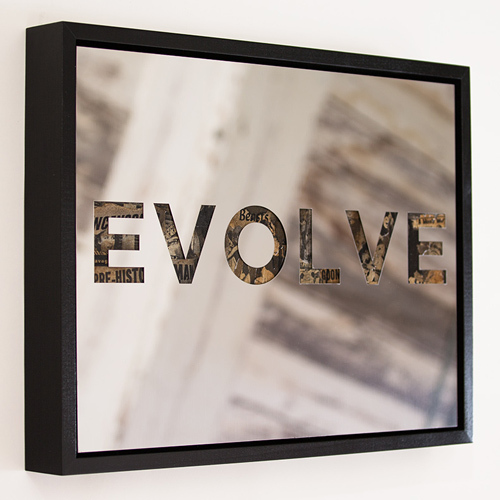 When creating the images, I originally intended the mirrored surface to act as a catalyst for self-reflection; especially given that each work contained a deliberately thought-provoking word, such as ‘beast’, ‘evolve’ or ‘lust’. However, I observed a very different type of interaction taking place at the exhibition. Rather than standing in front of the work, taking the time to reflect upon it (and contemplate their mirror image as part of the art), many viewers instead reached for their smart phones and began to take a ‘selfie’. As the artist, it was fascinating to observe this behavior. I started to wonder about the psychological rationale behind the action. What purpose was the act of taking a selfie serving to the experience of the image? What was the motivation behind it? And, perhaps most significantly; was it a positive, or negative thing to do so? In order to explore the motivation behind the act of taking a ‘self-portrait’ in front of the artwork, it’s important to delve deep into the nature of the selfie itself and try to understand the psychological implications behind the act. The term ‘selfie’ has been around for a decade or so now, although it has only really slipped into common usage in the last couple of years; making it a fairly recent phenomenon. However, once it took hold, the trend swiftly gained ground, and by the end of 2012, Time magazine referred to it as one of the top ten ‘buzzwords’ of the year. The term quite simply refers to the act of taking a photo of yourself, then sharing it with others, usually via social media. Initially, the selfie was perceived as a mere form of self-expression, a harmless way of connecting with friends and family. However, in recent months, the psychology of the selfie has come under close scrutiny; and experts speculate that the act of taking a selfie demonstrates narcissism, self-obsession and can even exacerbate body dysmorphic disorder. Selfies: Affirming the Self, or Losing Identity? Fans of the selfie often defend the right to take photos of themselves, stating that there can be no harm in celebrating self-confidence or physical appearance. There are others, however, who claim that selfies are potentially dangerous, and challenge the very roots of identity itself. According to Lucie Hemmen, a clinical psychologist and author, the act of taking a selfie can cause us to ‘ get so distracted by the marketing of ourselves, we can lose touch with our authentic identities and struggle to build real relationships’. According to psychologist Pamela Rutledge, ‘selfies frequently trigger perceptions of self-indulgence or attention-seeking social dependence that raises the damned-if-you-do and damned-if-you-don’t spectre of either narcissism or low self-esteem’. So, what then motivates people to take a selfie? Is it a desire for affirmation from others, a need to gain acceptance about physical appearance? Or is it a form of narcissistic exhibitionism, a way of ‘showing off’ to the world and stroking one’s ego? Perhaps the motivation is darker than this; a product of chronic low self-esteem, an anxiety about superficial image which needs to be continually reassured by an approving public? Why are we so entranced and captivated by the sight of our own image? Why do we feel the need to share it with others? Whatever the reason behind it, I was curious to explore why exactly my artwork triggered this psychological response in my audience. When observing visitors taking selfies in front of my work, I found myself trying to identify the heart of the action, the deeper, psychological implications of the act. In this instance, I concluded that taking an image in front of a mirrored piece of artwork with the word ‘beast’ across it is more than just a simple selfie. This isn’t merely a case of seeking affirmation from friends and family, or generating attention about appearance. In this case, an artistic image, already laden with connotation, is involved. So what exactly was going on? Why would someone want to capture their own image, reflected in a mirrored surface which spells out the word ‘power’, ‘lust’ or ‘master’? Obviously, there’s no definitive answer to these questions, only tentative speculation. I wondered whether it was something about the words themselves that inspired the need to snap a selfie; a strange desire to ‘connect’ with the phrase in question, to convey to the world that the meaningful word featured in the artwork was in some way indicative of their innermost identity. For example, by snapping a photo of one’s own reflection in the word ‘master’, one is essentially declaring themselves the master, taking on the role assigned by the reflection; announcing to the world a sense of connection to the deep-seated connotations of the word. By appearing in conjunction with the bold phrase ‘master’, by becoming part of the art, they take on a vital role in the experience; not just of observer and contemplator, but also the essence of the art itself. The act of taking a selfie is very immediate. It reflects a moment in time, a click of the finger. It is, by its very nature, the complete opposite of ‘traditional’ art. The selfie resonates perfectly with 21st century society. Every action we perform is shrouded in immediacy. When we want to find information, we search on the internet and locate it in minutes. If we want to purchase a rare item from the other side of the world, we order it online and have it sent to our house in a matter of days. Everything is readily available to us. Does this mean that humans, as a species, are no longer mentally or physically able to take the time to seek out the answer in the old-fashioned way? Must we always resort to our smart phones to capture the solution for us, so that we may pass the image to others and receive their opinions instead of relying upon our own? When I watched those people immediately pull out their phones and take photos of my work (some moving on in a matter of seconds), I found myself thinking about how differently people access art in the 21st century. Gone are the days where we stand for several minutes, pondering on the deeper meaning of an artwork, gazing intently at the color, the texture, the layout of the image. In 2015, we are more content to take a photo (with ourselves in the foreground, adopting the starring role) and move on swiftly to the next. Are we victims of our own immediacy, our own insatiable desire to possess information, thought and material possessions in record time? Or is it simply a case of natural human progression? Have we, as a species, changed? Does art now have a very different meaning for us? These are, of course, impossible questions to answer. But one thing certainly seems clear. The age of narcissism is very much upon us, and it has considerable impact on the way in which we access and experience art.